Today’s college student was virtually born with a smart phone in their pocket. Smart phones and computers are ubiquitous, and so are messages via these devices. To engage with a college student and truly earn their attention, today’s college admissions departments need to differentiate their student recruitment strategy. The most engaging and effective college student recruiting strategies are “novel,” tangible, creative and surprising. BookWear® has, literally, all of those features. Recruiting college students with BookWear® can significantly empower your recruitment strategy. BookWear® is a little package that looks like a book with your photos and message custom printed on the cover. 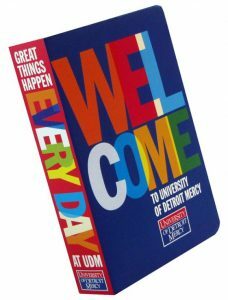 This “book,” which, can be mailed like a thick post card, contains a surprise gift inside that’s customized with your college’s logo. Imagine your recruiting effectiveness when a prospective college student receives your “book” with “Congratulations on Your Acceptance” and photos of your campus on the cover. There’s accompanying text to highlight your programs and features, and the prospect’s full attention is on your message! And it’s not over. College students are compelled to read your message and open the package. The open rate of BookWear® is huge, and so is the conversion rate. Inside is your custom gift (24 to choose from) which has your logo on it. Every time a student uses the gift, they’re reminded of your college campus, and your message. Some of the most effective college recruiting strategies with BookWear® use T-shirts as gifts. When students wear their shirts, they start identifying with your college or university. Additionally, your college recruiting efforts are multiplied as the fellow peers acknowledge their friends’ connection with your college. Investing in BookWear® offers one of the most effective recruiting strategies. In addition to college recruitment strategies, BookWear® works for student orientation, retention, fundraising and other activities. Any context that demands a message gets more attention with BookWear®. You can insert additional materials inside the book, like a campus map, a coupon to the bookstore, an RSVP card with your return address. You supply the piece ready-to-go and we’ll insert it for free. If you’ve been folding, stuffing and mailing your student recruiting T-shirts and packages yourself, we can do it for you. Marry your message and T-shirt together in the BookWear® package, send us your mailing list and we’ll do the fulfillment. We receive many “Thank You’s” from universities that are thrilled to have the whole program handled so seamlessly. 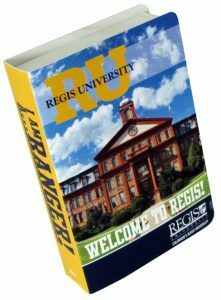 Unlike other college student recruitment strategies that use generic gifts and giveaway items, BookWear® is a tangible and dimensional concept that offers limitless ideas to make novel impression. The cover is customized with your graphics and your unique message. Combined with the element of surprise, BookWear® is a compelling form of communication that cannot go overlooked. Traditional college recruiting giveaways are often stale and all too common, thereby lacking novelty, excitement, and effectiveness in their purpose. To truly connect and resonate with your target audience, you need some creative, unique, and interesting. BookWear® offers the foundation to make a meaningful connection, enabling you to get your message across in an amusingly offbeat way. So don’t settle for generic college student recruiting giveaways. Strike a chord with each and every recipient, and invoke feelings of inspiration and enthusiasm for your cause by using BookWear®. Learn more about BookWear® and how it makes for one of the most effective recruitment strategies. To brainstorm your own recruiting ideas and designs, take a look at our Testimonials page where you can see samples, layouts, titles and texts of many recruiting, orientation and marketing “books”. Our staff would also be happy to help you build your college recruitment strategy. Contact us here.